You may remember my photo frame dry-erase menu board that I was using for my weekly menu back in Seattle. Well, since my menu board didn't make the trip to Iowa (don't worry, it's in storage! ), I had to find a new menu board idea. Otherwise I forget what I planned for dinner that week--seriously. I was inspired by the Notes plate over at Wonderfully Wordy at Christmastime (she has GREAT ideas, and you can buy the cut vinyl from her, but her shop is closed for the summer). I pinned it to my Crafty Ideas board on Pintrest and came across it again the other day. LOVE Pintrest! This cute dry-erase board costs less than $5 to make, and is great for menus, to-do lists, or just love notes to your sweetie! 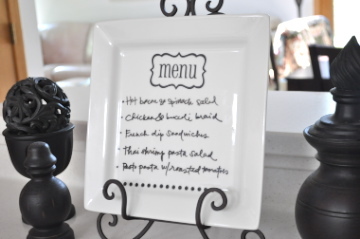 Here's how you can make a dry-erase board out of a plate, too. Cut your words and any embellishments out of vinyl. I used the Pharmacy font. Carefully adhere it to your plate. I say carefully because it's awfully easy to put it on crooked (please try not to notice--I'm going to fix it tomorrow)! Now you can write your weekly menu on it and simply erase it with a paper towel next week. And it sure ups the cute factor in the kitchen! This is way cute and super simple! I love it :) Good job! Love this idea! Simple and stylish. What a great idea! I'm so going to make one. Thanks for sharing. didn't know you can use dry erase on dinner plates thanks for the tip! It is beautiful I am going to have to make a couple of these as gifts. So going on pintrest! I made myself one of these last year, they work so well! Nice job! Will you be putting more of those great magnets back in your shop any time soon? I never picked any up to put my board on my fridge, but would really like some now that I finally got around to making my board! Thanks for sharing this great idea. I just found your blog and I love it. So many cute and creative ideas. Got it pinned. Super idea for easy gifts. I love how the simple ideas are always the cutest! Totally doing this!